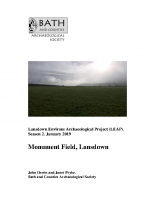 Bath Archaeological Trust (BAT) performed a watching brief for Aquaterra as new irrigation work on the eastern portion of the Approach Golf Course at High Common, Bath in late June, 2004. 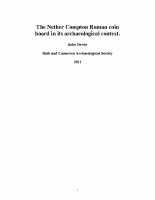 During that exercise, evidence of occupation in Roman times was unearthed. 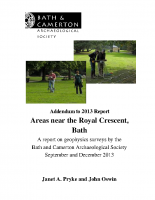 BAT requested that the Bath and Camerton Archaeological Society (BACAS) perform a geophysical survey to observe more of this occupation. 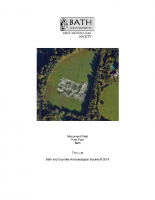 The Keeills Research Project, in conjunction with BACAS, carried out geophysical surveys aimed at detecting and characterising subsoil features associated with Corrody Keeill, an Early Christian Chapel. 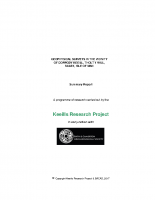 The Keeills Research Project, in conjunction with BACAS, carried out geophysical surveys aimed at detecting and characterising subsoil features associated with Keeill Bow, an Early Christian Chapel. In March 2018, BACAS undertook a geophysical survey of extant earthworks known as the ‘Romano-British Settlement’ in a triangle shaped field to the east of Sir Bevil Grenville’s Monument. This site is a scheduled monument, Site No. 1004527. 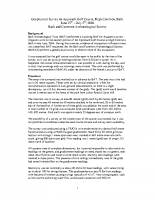 Several anomalies of an archaeological origin are clearly visible. Cut features such as banks, ditches, walls and structural features have been identified on the ground and in both the resistance and gradiometer data. 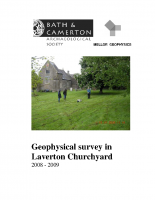 This geophysical survey was set on Monument Field on Lansdown, Bath and North East Somerset, immediately south of the Grenville Memorial. 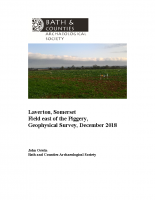 The magnetometry survey indicated the extent of the pre-historic/Romano British settlement found in the south-west corner of Settlement Field and showed that it extended under the wall some 150 m westwards and 150 m northwards from the south-east corner of Monument Field. This was supported by evidence from magnetic susceptibility and twin-probe resistance. Ground disturbance extending north-west from the settlement appeared to relate to the Battle of Lansdown, fought in this field in July 1643. A number of long lines of straight sections joined at angles probably relate to practice trenches dug in World War 1 (1914-1918). The survey also showed a former pond, an area which may have also been a pond, but may be a small henge, and a probable barrow. 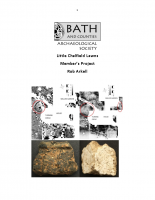 Resistance and magnetometry surveys were carried out in the grounds of Little Chalfield Manor to look for evidence of earlier medieval buildings. 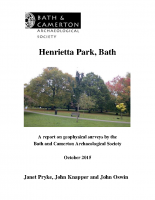 The magnetometry survey revealed a portion of a circular feature twenty metres in diameter. A trench through the feature discovered a ditch containing bronze age pottery in the ditch fill. This suggests the feature is the remains of a ploughed out round barrow similar to others in the vicinity. The resistivity survey did not show any linear high resistance features which could be interpreted as walls but one pattern of low resistance was investigated. A trench across the feature contained demolition rubble (mortar, plaster, window glass and building stone fragments) which indicated that a building, thought to be the medieval manor which was demolished in 1830, had stood nearby. Monument Field at Prior Park is named for Ralph Allen’s Monument, built circa 1766 by Bishop Warburton following Allen’s death, which was demolished due to its dangerous condition in 1953. An earlier Gothic Lodge on the same site from the 16th century or earlier seems to have formed part of the later Monument. In addition the Wansdyke, dug circa 6th century, possibly crossed the field. 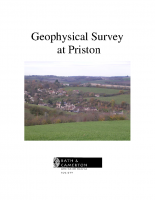 Geophysical survey has confirmed that there is stonework probably related to the Monument and Lodge structures in an area which relates to the mapped position. A bank and ditch which may be the Wansdyke also exists as shown on the 1939 map. 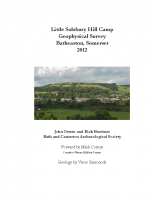 A survey of Goosemead, to the north of already-surveyed Town Hill, had to be abandoned in 2015 when vital equipment failed. It did not prove possible to return to the field because of incompatible agricultural use. 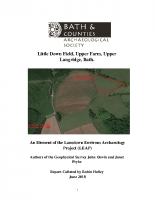 A survey in 2016 concentrated on Inland, a triangular paddock to the south-west of Town Hill, immediately across a lane from that field. This showed significant activity, including half of a sub-circular enclosure at its western end. 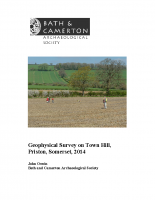 An area of approximately 4 ha was subject to geophysical survey in the field called Town Hill in Priston parish, just to the west of the village. The survey indicated a field system of curving ditches on the far west of the field, probably extending under the Marksbury lane, which is probably prehistoric in date, also with a possible round house at the south end of the survey, on the plateau. Towards the north end of the field, at the bottom of the north-facing slope, there were signs of activity around an earlier stream path. In the far north-east of the field there were signs of a substantial structure, which probably extended north into Goose Mead and east under Mill Lane. 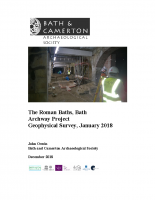 The geophysical survey was undertaken as the first part of archaeological work in the vaults to the south of the Great Bath in the Roman Baths at Bath. There were two areas under the vaults to be surveyed, and these were separated by a single wall. Twin-probe resistance survey, where possible, and resistivity profiles were carried out. Resistivity profiles to a depth of 2 m proved the most useful technique. Most features were observed at approximately 1 m depth. These included a number of probable drains running to the centre line of the area. Between this central line and the wall of the Great Bath, there was another substantial feature from 1 m depth downwards, midway along this area, not previously identified. Other techniques tried included thermal imaging and ground-penetrating radar. The lawn below the Royal Crescent Ha-ha in Bath was part of an archaeological investigation in 2002 for a Time Team television programme on Channel 4. In this they confirmed the route of and excavated a known Roman road down across this lawn, and also excavated nearby burials. They also revealed and excavated a Late Bronze Age ditch. 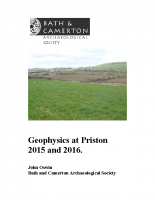 This project extends the geophysics part of this work, and demonstrated that the Late Bronze Age ditch is extended to an enclosure. 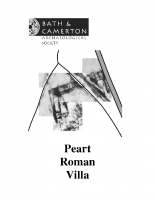 This work also investigated a large ditch-like formation running from NE towards the SW across the lawn, and other features including an area with pit-like chambers below the ground.